Sky Foster, department manager for Corporate Communications at BMW Manufacturing Co. When BMW announced that it was opening its first North American production facility in South Carolina, it created a seismic shift in the state’s manufacturing landscape. In 1992, South Carolina was known more for making towels and sheets than cars. Over 20 years and more than $7 billion in investment later, BMW has helped transform South Carolina into a major epicenter of advanced automobile manufacturers and suppliers. Technical skills are essential to this industry, and readySC™ has partnered with BMW from the start to help recruit and train its workforce. Today, BMW faces new challenges as its initial workforce begins to consider retirement and succession planning becomes a necessity. 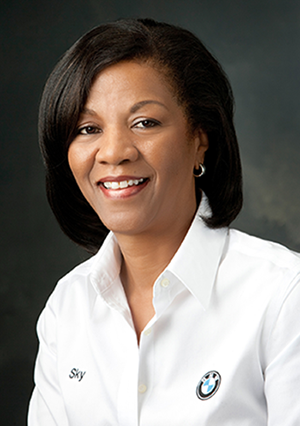 Sky Foster, department manager for Corporate Communications at BMW Manufacturing Co., talked with EDGE about the extraordinary achievements of the South Carolina plant, and the importance of readySC and the SC Technical College System to its past and future success. EDGE: BMW recently announced that the South Carolina site had reached a major milestone by becoming the largest BMW facility, is that correct? Sky Foster: Yes, we are now the largest plant within the BMW production network by volume. That’s quite an accomplishment for South Carolina, coming from being a green-field and a startup just over 22 years ago. To have accomplished what we have accomplished to date is absolutely phenomenal, because South Carolina wasn’t an automotive hub. We didn’t know how to manufacture cars. But, because there’s such a resilience in the people of the state of South Carolina, we learned how. The skilled workforce that we have is a huge reason behind our success, but we also had the support of the statewide technical college system, which includes readySC. There was a pro-business attitude in the state of South Carolina, and all of those factors came together to make us who we are today and positioned us within the group to be extraordinary. Our associates have such a tremendous sense of pride, and when you feel good about what you do, you’re really good at it. 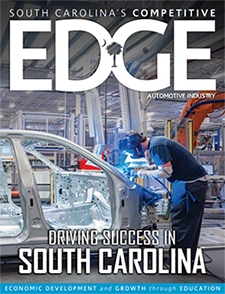 EDGE: Tell us about how BMW has grown in South Carolina over the years. EDGE: How many people are employed at the Spartanburg site now? SF: We have more than 8,000 jobs on-site. That’s a lot of people. We call it our own little city. There’s no slowing down, with 5.6 million square feet and growing…and growing. Honestly, we had no idea how much it was going to grow when BMW first came to South Carolina, and I have been here since the start. I’ve seen the company go from initial construction to where it is today, from just a handful of cars to now over 1400 produced a day, and that’s incredible — it truly is. EDGE: Since you have the unique perspective of being here from the beginning, what was your experience with readySC and its training and recruitment program during BMW’s startup phase? We rely heavily on the expertise that the readySC group provides. They have the knowledge and the know-how, and they know the people and the state. They know recruiting practices, on-boarding, assessment, designs and manufacturing models. That knowledge was extremely valuable in helping us to secure a productive workforce initially, and as we continue today. It has been a great partnership — a really great partnership. EDGE: Do you see any new workforce challenges now that BMW has been here over 20 years? SF: Some of our people who have been here from the start are now in preparation for retirement. They have a deep knowledge of processes and technologies that has created the successes of our business today. Somehow we must find a way to preserve the skillset of that highly valued human capital. The people who are now looking to retire have been some of the best innovators. We continue to design programs to help learn from that generation and to teach the next generation. EDGE: How does apprenticeship and the Tech Scholars Program help that transfer of knowledge? SF: We need technicians, as does every industry. We all want a technically skilled workforce, and it’s important to maintain and grow that workforce. That was the genesis of the Tech Scholar Apprentice Program. We worked with several educational institution partners to develop the program. The candidates are enrolled for a two-year period typically in the areas that are relevant to manufacturing technologies. In addition to that, we offer the advantage of tuition and book assistance. Participants are working 20 hours per week, and they’re in school 20 hours per week. It is a good example of how collaboration between education and manufacturing can lead to employment and give better outcomes and opportunities for the next generation. We give them the work experience and support them in their education as they continue to enhance their technical knowledge. EDGE: It sounds like you’re doing a great job of preparing for the change in your workforce. SF: I think we are positioned to be prosperous in the future. It is a strong collaboration. Through succession planning, we’re strengthening employees’ skills and abilities. The goal is to continue to give people what they need to be successful at their jobs. 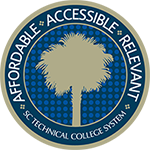 EDGE: Do you have any other thoughts about the readySC program and the SC Technical College System? SF: Our partnership with readySC shows a great example of how collaboration between education, the public sector and the manufacturing sector can lead to employment for South Carolina residents. Because of readySC, we were able to receive better outcomes and offer better opportunities for this generation and the next generation to come. I think we should continue the partnership with the readySC program and the technical colleges. It has been very rewarding for the company. It has laid the groundwork for our current success, and will allow us to build on that success in the future. readySC understands the driving force behind success — adaptability, speed, flexibility and a highly skilled workforce. BMW is extremely pleased to have a great partnership with readySC. The South Carolina BMW facility reached a major milestone in 2015 when it became the largest plant in the BMW network by volume. According to a January 2016 press release, BMW Manufacturing recorded its largest annual production in 2015. Exactly 400,904 X-models rolled off the line last year making the South Carolina plant the largest volume producer in the company’s global production network. This achievement represents a 15% increase over the production volume for 2014 (349,949). In 2015, the plant exported 70% (281,256) of the total volume to over 140 countries around the globe. In 2016, the company’s U.S. factory will continue its three-year, $1 Billion investment that was announced in 2014. This expansion will further increase the plant’s overall capacity and add a fifth model to their vehicle line-up, the all-new BMW X7. By the end of 2016, the plant’s annual production capacity will increase to 450,000 units. BMW began manufacturing vehicles in the U.S. in 1994 and has produced over 3.3 million vehicles in the last two decades. Presently, BMW Manufacturing produces over 1,400 vehicles each day. BMW Group has invested over $7 Billion in the South Carolina plant. MW announced in 1992 that it would build an advanced automotive assembly plant in South Carolina along Interstate 85, potentially employing thousands of workers. 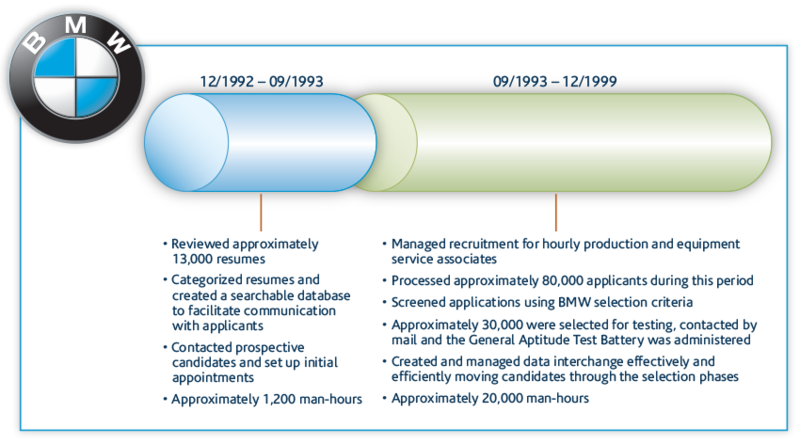 Over the course of the initial 10 year project, BMW Manufacturing grew to a productive workforce of more than 4,300. Discovery. Several initial trips to Europe to better understand the needs of the project and to learn first-hand the processes, understand the specifications, and meet with suppliers, subject matter experts and existing trainers. Recruitment. Provided all in-state advertising for recruitment of Production Associates and Equipment Service Associates. Assessment. Implemented a six-phase applicant assessment system by providing all materials, testers, assessors, scheduling, scoring, phone screening, status line and testing venues. Pre-Employment Training. Provided all instructors, materials and classrooms for customized training. Technical Training and OJT. Training for specialized paint shop, dent masters, function build cars, SAS, ISO 9000, industrial technology training and training equipment. Up-fit of the BMW Training Center. Renovation of a nearby building providing expanded training space, offices and testing areas for the project. “readySC helped BMW achieve a remarkably fast start-up – 23 months from turning the first shovel of dirt to the first car rolling off the line,” said Carl Flesher, vice president of Corporate and Community Relations at BMW South Carolina. BMW Manufacturing Co., LLC is a subsidiary of BMW AG in Munich, Germany and is the global producer of the BMW X3 and X5 Sports Activity Vehicles and X4 and X6 Sports Activity Coupe. In addition to the South Carolina manufacturing facility, BMW Group North American subsidiaries include sales, marketing and financial services operations in the United States, Canada and throughout Latin America; and a design firm and technology office in California. For more information on BMW Manufacturing, visit www.bmwusfactory.com.